Director Giau Minh Truong said his adaptation of "Ching Chong Chinaman" is about an Asian-American's family life. CHINATOWN — A Northwest Side director's adaptation of a satirical play just might upend everything you think you know about life inside Asian-American households. Presented by the A-Squared Theatre Workshop, the script reading for "Ching Chong Chinaman" takes place 2 p.m. Saturday at the Chinese-American Museum of Chicago, 238 W. 23rd St. The satirical play, written by Lauren Yee, follows life inside a Chinese-American household, but the family is not what viewers might expect. There's Ed, a hands-off husband who's drifting from his depressed wife, Grace, and their kids — a daughter struggling to get into an Ivy League college and a son who's seeking community in the world of online role playing games. Together, they're living an American life unmoored by cultural identity. That's because they never really had one in the first place, says director Giau Minh Truong. "First off it's a comedy but I also like the idea that Lauren Yee had a very specific message that's open to interpretation. And the way I interpret the play is this idea that, as Asian-Americans, we're sort of outsiders among the Asian culture outside of the U.S.
"And with second or third generations, you're sort of even more separated from that [world] culture, and so we start seeing it through the Western view," he said. Underneath all of the irreverent, hilarious misunderstandings — at one point the family hires a Chinese indentured servant — there's a strong message about cultural identity. "I think the message of the play is that your culture is really about your family unit, your friends, your community. It doesn't really matter where you're at. If you have that, you can get strong and grow together," he said. Born in Vietnam, Truong was part of a wave of untold thousands of refugees who fled the country on ill-equipped boats. His family eventually made it to America, settling in Humboldt Park. 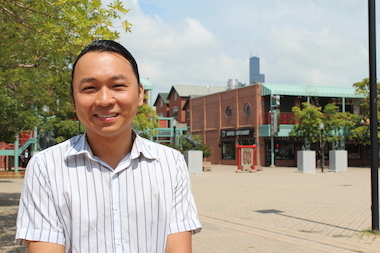 Now 36, the Albany Park resident has worked to become a stage manager for Chamber Opera Chicago, an actor with the Dream Theatre Company and a teaching artist with Storycatchers Theatre, which presents plays to inner-city kids. Truong said Saturday's event will serve a few purposes for both the actors and the audience: the actors will get to rehearse in front of a crowd while the audience will get a behind-the-scenes glimpse of how a production comes together. "What they're going to be seeing is a play in the second week of rehearsal. They'll see some depth but they'll see some of the process," he said. The show is scheduled to debut Sept. 27 at the Raven Theater in Edgewater. Meanwhile, the A-Squared team is working to raise money to finish the production via an Indiegogo campaign. The script reading event is free to attend but space is limited. Call 312-949-1000 to reserve a spot.